There are a lot of new, interesting casual styles, that you’ve probably seen, but may be unsure how to wear. Even if you bought the right piece, it’s not always clear how to pull it together. Here are some general guidelines, along with a few specific suggestions. After all, putting pieces together in the right outfits is almost as important as purchasing the right items to begin with. 1. 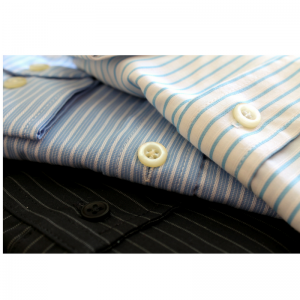 If you want to look professional, but aren’t wearing a tie, try one of the new banded collar shirt looks. They come in ready-made and custom styles. I suggest white or another pale shade, and not a pattern. 2. An unstructured jacket in a silk, linen or cotton blend is a perfect layering piece for when you want to avoid a suit or sport coat. These jackets are meant to be worn with a button-down oxford shirt, in cotton, denim or chambray, without a tie. They are equally comfortable with jeans or khakis as they are with dress trousers. 3. Play around with proportions for a creative look. Try cuffed, wide-leg palazzo pants with a fitted longer blouse, or a top with wide bell cuffs. Wear narrow leg trousers with a drapey, less formal top, such as one with a rounded tie neck, or square almost off the shoulder look. Try short, long and extra-long jackets. Short jackets are better with wide, drapey leg pants and chunky heels. Long work with traditional slacks, or narrow-leg trousers. 4. Vests are a good go-between for looking pulled together but not too formal. Vests work over blouses, knits, sleeveless tops and t-shirts. I don’t recommend wearing them with polo shirts. Try a longer vest with narrow pants, or a shorter, fitted vest with wide-leg pants. 5. Try mixing patterns by using combinations that contrast two different looks such as stripes and a floral, or a liberty pattern with a paisley. You can also mix vertical stripes, with horizontal stripes. The key is to keep colors similar and sizes different. 6. Slouchy, double-breasted jackets are very trendy, and also fill the gap between professional and relaxed casual. They are perfectly appropriate when you want to wear a jacket but not look stuffy (plus they are really comfortable). I suggest pairing them with straight leg pants or skinny jeans.